The Tiptree Bake Sale is on! Ruth Leibig is running the traditional Tiptree bake sale on Saturday at 3:00pm in the con suite. Bring your baked goods to the con suite on Friday and Saturday, bring your money to buy some of the delicious treats we’ll have available. Proceeds support the James Tiptree, Jr. Award, an annual literary prize for science fiction or fantasy that expands or explores our understanding of gender. The 2013 winner and books of honor have just been announced. Need directions to get to the con? They’re up on the website now! There is still one Con or Bust sponsored membership/banquet ticket left. This entry was posted in Uncategorized on February 18, 2014 by Lucy Huntzinger. Cliff Winnig will be joining David Levine and Rachel Holmen as critiquers for the workshop. His short fiction appears in many places, including the forthcoming When The Hero Comes Home 2 (Dragon Moon Press) and The Aether Age: Helios (Hadley Rille Books). He is a graduate of the Clarion Science Fiction and Fantasy Writers Workshop. The Sainte Claire Hotel is beautiful and it’s in a great location in downtown San Jose. You’re going to want to stay there. The deadline for reserving a room is this Thursday, February 6th. Reservation information is at http://www.potlatch-sf.org/hotel/. Freddie Baer has created a fabulous T-shirt design for Potlatch 23. 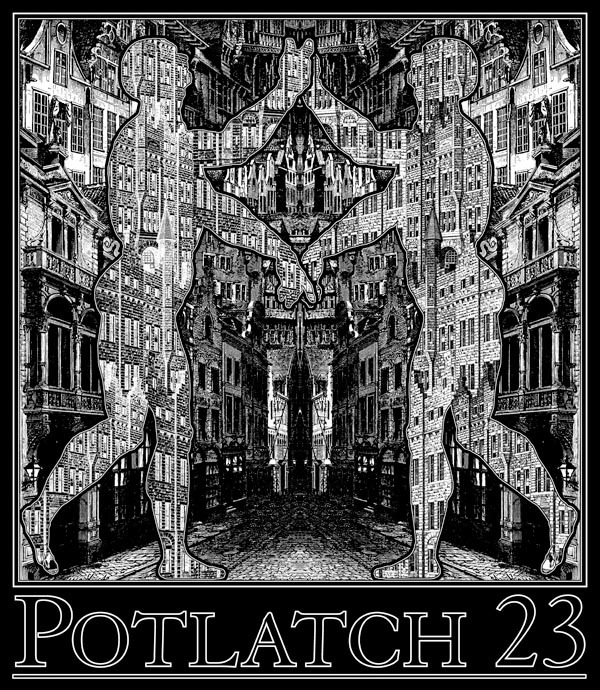 Check it out: http://www.potlatch-sf.org/posts/potlatch-23-t-shirt-design/. Quantities will be limited, so if you want one (you really do want one, this is superb art), you can pre-order it at http://www.potlatch-sf.org/registration/. Join now to participate in the discussion! Potlatch 23 memberships are $50. Youth memberships are $25. Children 6 and under may attend free. The banquet brunch on Sunday morning is $25. And you can order a T-shirt for pick up at the con. http://www.potlatch-sf.org/registration/. This entry was posted in Uncategorized on February 4, 2014 by Lucy Huntzinger. 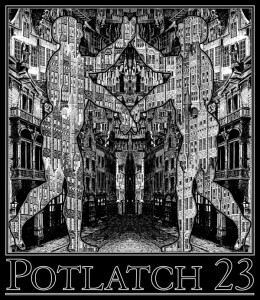 Freddie Baer has created a fabulous T-shirt design for Potlatch 23. Quantities will be limited, so if you want one (and you know you do), you can pre-order it at the registration page. This entry was posted in Uncategorized on February 3, 2014 by Tom Becker.